Dubrovnik is among most popular cruise destinations in the Mediterranean. 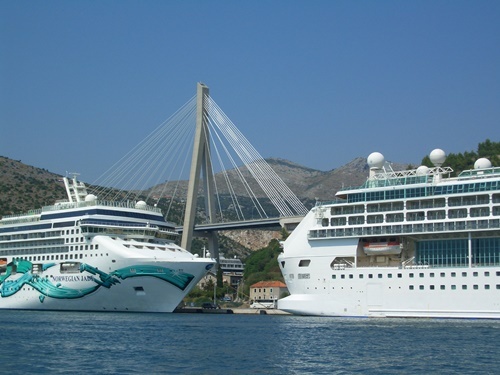 The ships owned by the most largest cruise liners (Royal Caribbean, Holland America Line, Celebrity Cruises, Norwegian Cruise Line, Azamara Cruises, P&O Cruises, Princess Cruises, MSC Cruises) bring a huge number of passengers to Dubrovnik. In 2018 there was 440 ship calls with over 740 000 passengers. This make Dubrovnik port third in the Mediterranean and tenth in the world. Dubrovnik is a mainstay on Eastern Mediterranean cruises, sprinkled among greatest - hits stops like Athens, Venice and Greek Isles. If you are joining a cruise ship in Dubrovnik and need an accommodation close to the port there is a great choice of rooms and apartments only minutes' walking from the port. There are also two hotels: Hotel Berkeley and Hotel Petka. If you are joining a cruise in Dubrovnik and arriving by plane you can take an airport shuttle bus which will take you to main bus station which is next to the cruise port. If you prefer more comfort you should pre-book a private car transfer in advance. The driver will wait you at Dubrovnik airport arrival terminal and drive you directly to the cruise port. If your ship anchor in front of the Old Town (next to the island of Lokrum) a tender boat will take you to the Old harbour – just a few steps away from central street of Dubrovnik –Stradun and all Dubrovnik attractions. This is the most favorable option since you don't have to worry about your transfer to the Old Town. Gruz port is located about 3 km northwest from the Old Town. Even the biggest cruise ships can dock at this port and it's able to accommodate a few of them at the same time. If you are visiting Dubrovnik on a busy day (usually during summer months) your ship may anchor in front of new port. In this case tender boat will take you to the port (5 minutes ride). Considering the number of cruise ships that can visit this port in the Adriatic at the same time (on some days even 10) for some cruise ships anchoring and tendering will be inevitable. Find out which ships are in Dubrovnik port with your ship on any given date! Many cruise companies provide free shuttles from Gruz port to the Old Town. It's 15-minute ride. You will be dropped off right at Pile Gate, the western entrance to the Old Town. When you go outside cruise port area you will find a taxi stand from where you can take a taxi to the Old Town. The ride to Pile Gate will cost you €10.00. You can take city buses from the stop on main bus station (buses no. 1, 1A, 1B, 3). Tickets can be bought from the nearby kiosk or from the bus driver. For more detailes on city buses check here! What to do while in Dubrovnik? 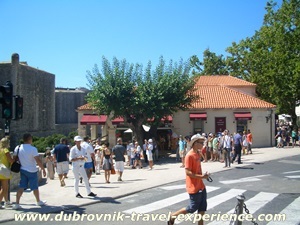 Be sure to take a walk along the City walls when in Dubrovnik. You will enjoy amazing view of the Old Town from above and have a change to take great photos. If you take Cable car, in only 3 minutes you will find yourself on the top of Mount Srdj above Dubrovnik. From there you will have spectacular views over Dubrovnik and nearby islands. The cable car embarkation station is only few minutes from the Old Town. While in Dubrovnik you can take a range of organized city tours as well as tours to surrounding area (Elaphite islands, Konavle, Peljesac region). To see City walls from the sea take an organized sea-kayaking tour which departs near Pile Gate. While in Dubrovnik taste some of delicious local meals prepared in one of the numerous taverns and restaurants situated all around the city. Food is mostly based on fresh fish and shellfish from the Adriatic and greenery from the surrounding area of Dubrovnik (Konavle, Zupa Dubrovacka and Dubrovacko Primorje). Be sure to buy some of local products (sweet delicacies, wines, olive oil, lavander, herb liqueurs, paintings) which will remind you of your visit to Dubrovnik.